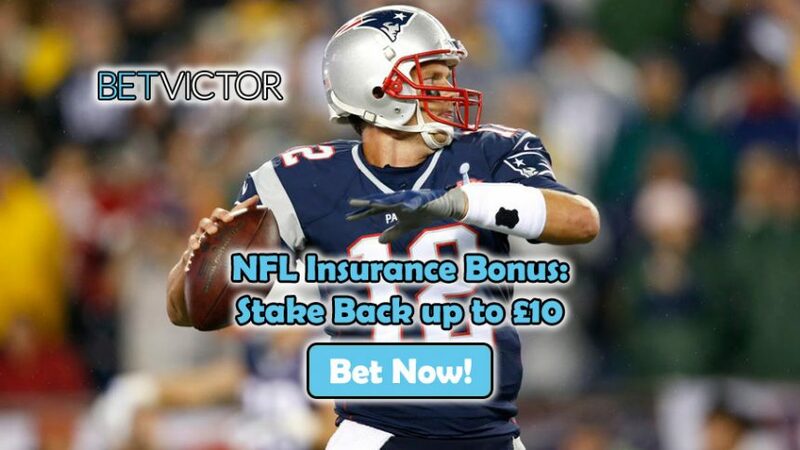 Protect your bets with BetVictor's NFL Insurance Bonus! Protect your bets during the regular season action with BetVictor’s NFL Insurance Bonus! Back your favourite teams in the NFL and in case something goes wrong, BetVictor will give you a Stake Back up to £10 which you can reinvest into other games. Collect the NFL Insurance Bonus with two simple steps: 1) make an NFL multiple bet that contains 3 (or more) legs on the Money Line, Handicap or Total Points betting markets, 2) recline on your couch with a cold lager by your side and enjoy the show; if one of the legs of your wager doesn’t go to plan, you’ll receive a refund up to £10 with the NFL Insurance Bonus. BetVictor will credit your account with bonus funds that can be used on another NFL multiple bet, so you’ll have another chance to make a killing during the regular season. This offer can be claimed until the end of the regular season, but just make sure to place your bets on 3 (or more) legs on any combination of NFL games (in-play and pre-match bets apply as well). If one leg of your bet lets you down, you’ll get your money back up to £10 with the NFL Insurance Bonus. Collect £10 with the NFL Insurance Bonus!